Team: Brzozowski, Felix, Genovesi, Bettache, Omar, Noel-McLeod, Tilt, Mesias, Platt, Bansal-McNulty, Shodipo. Confirmation that this fixture was to be played at the JobServe Community Stadium rather than Florence Park meant that this was to be a new ground for R’s fans to visit. Steve Bacon collected Alan Barnes, ChrisPTenner and myself from ‘The Railway Hotel’, next to Greenford Station. Unless you happened to be a Colchester season ticket holder, admission prices were outrageously fixed at £10 for adults and concessions were still priced at £7! 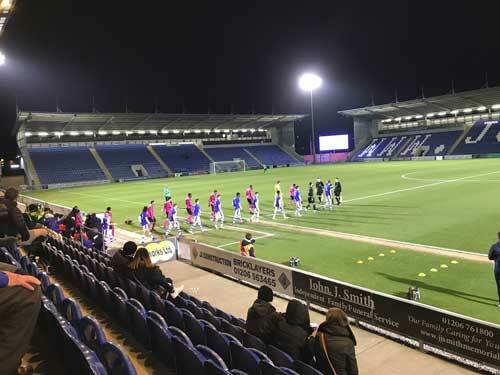 Rangers had beaten bottom-placed Colchester 6-2 in November. I noted that the U’s had managed to beat Cardiff City 2-1 last week. I met up with Colin Woodley outside the ground after collecting some team sheets. Chay Tilt had been on trial at Walsall and it was good to see Olamide Shodipo in the starting line-up after being sidelined since September with a thigh injury. Joe Felix took off down the right-wing, which resulted in a great ball across the six-yard box, but somehow it evaded two of his team mates. Chay Tilt had a shot well saved by Barnes but with a team mate in space, a good follow-up opportunity was put wide. Olamide Shodipo moved in from the left-flank to just outside the box and lobbed the ball just wide of the far post. Not surprisingly the R’s took the lead on 18 minutes following Chay Tilt’s through ball. Amrit Bansal-McNulty finished in the far corner from a good angle. The home side picked up their game for the final 15 minutes of the half. Marcin Brzozowski punched Ager’s powerful effort away for a corner. This led to a good defensive block, which was immediately followed by the R’s keeper doing well to get a hand to the ball and the threat was averted. Half-time: 1-0. Sixteen-year-old Dillon De Silva made his debut for the U23’s when he started the second-half at the expense of Olamide Shodipo. Minutes after the break, a good ball found Tilt on the right-flank. He proceeded to send in a low cross, which a well-placed De Silva put just wide of the post. Whilst at the other end, Dean Ager shot just over the crossbar from inside the box. On 54 minutes, Mickel Platt turned, and the R’s No.9 shot low, aiming for the near corner, but Dillon Barnes saved it and the ball went behind for a corner. Colin announced that the temperature had indeed fallen below zero. Paul Hall made a double substitution on 63 minutes. Joe Felix and Ali Omar were replaced by Charlie Fox and Ben Wells respectively, whilst Caden Genovesi took the captain’s armband. The U’s equalised on 69 minutes via the penalty spot. Mr Cartmel awarded the spot kick after a foul on Todd Miller. Louis Dunne stepped up and made no mistake, sending Brzozowski the wrong way. Rangers could well have taken the lead in the 82nd minute when good anticipation by Dillon De Silva set him up one-on-one with Dillon Barnes and the keeper made an excellent block with his body. Mickel Platt’s follow-up effort was then headed off the line by David Agboola. For the home side, a miskick from close range was screwed wide of the post. Colchester sealed their win with around five minutes remaining. First-year scholar Jake Hutchinson had only been on the pitch a couple of minutes when he met Dean Ager’s cross at the back post. Rangers take on Charlton Athletic at Harlington next week. Thanks to Steve Bacon for the lift and also to Colin Woodley for sending me the above pic. With a very sparse two men and a dog crowd it was probably the coldest I have experienced at a match since the 60’s! A well appointed comfortable stadium and deserving of a higher level of football. Great to put faces to names and I was glad I only had a ten minute drive home! No mention of the Adult Shop on the A12 being the highlight of the trip !!! I also saw Ebereche Eze play there for England Under 20s v Germany 3 months ago. It was absolutely freezing that night as well and they ran out of hot water at half time in the tea bar !! !